Staffords, leading the way with fine-food brands for the best part of a century, is the nation’s favourite for exclusive brands that families and their friends know they can trust. Now Staffords has added delicious Granadilla Curd to its range, and it’s versatile as well as bursting with tangy flavour. 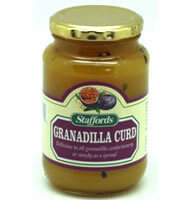 There is something deeply satisfying about fruit curds, and a jar of Staffords Granadilla Curd proves it. Not only is this smooth and creamy treat a family favourite as a spread on their favourite wholesome bread, it’s divine in so many other ways too. There are literally hundreds of baking recipes that show off Stafford Granadilla Curd at its wonderful best. Try it as a filling for tarts, trifles, sponges and cakes! Staffords Granadilla Curd is light in texture and can be made even lighter and more creamy with the addition of whipped cream. As with all Staffords products, the ingredient everybody loves is value. Staffords Granadilla Curd is destined for family fridges throughout South Africa and is available at all leading retail outlets nationally.